Virginia defeated Texas Tech to become the 2019 NCAA men's basketball champion on Monday at the 2019 Final Four. Here is the updated NCAA bracket for the 2019 NCAA Division I men's basketball tournament, also known as March Madness. You can click or tap right here to open up a printable version of the March Madness bracket pictured below in a new tab or window. You can print the bracket in landscape or horizontal mode. 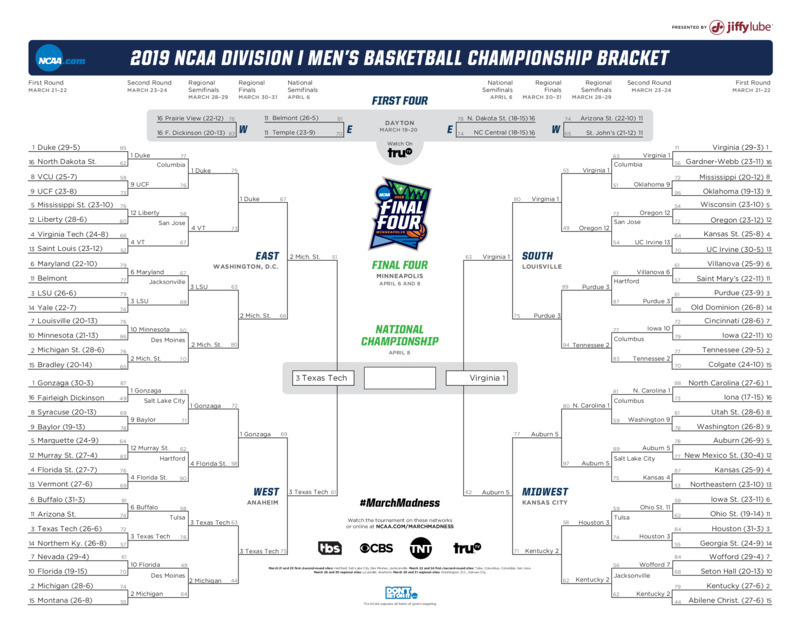 Here is a .JPG of the 2019 NCAA bracket if you'd prefer a copy in that format. Regional sites in 2019 were Hartford CT, Salt Lake City UT, Des Moines IA, Jacksonville FL, Tulsa OK, Columbus OH, Columbia SC and San Jose CA. The Final Four and national title game are in Minneapolis. Here is information on how to get tickets. There are two ways that a team can earn a bid to the NCAA tournament. The 32 Division I conferences all receive an automatic bid, which they each award to the team that wins the postseason conference tournament. Regardless of how a team performed during the regular season, if they are eligible for postseason play and win their conference tournament, they are selected to receive a bid to the NCAA tournament. These teams are known as automatic qualifiers. The 10-member NCAA Men's Division I Basketball Committee is responsible for selecting, seeding and bracketing the field for the NCAA Tournament. School and conference administrators are nominated by their conference, serve five-year terms and represent a cross-section of the Division I membership. What's this new thing called the NCAA evaluation tool? What is the importance of seeding in March Madness? The men’s college basketball tournament is made up of 68 teams. On Selection Sunday, before any tournament game is played, those teams are ranked 1 through 68 by the Selection Committee, with the best team in college basketball — based on regular season and conference tournament performance — sitting at No. 1. Four of those teams are eliminated in the opening round of the tournament (known as the First Four), leaving us with a field of 64 for the first round. In order to reward better teams, first-round matchups are determined by pitting the top team in the region against the bottom team (No. 1 vs. No. 16). Then the next highest vs. the next lowest (No. 2 vs. No. 15), and so on. In theory, this means that the 1 seeds have the easiest opening matchup to win in the bracket. You can print out that bracket at the top of this article. You can also go here to play the official NCAA Bracket Challenge game. For tips, we’ve got you covered with BracketIQ. There are more than 50 guides there to help you fill out your bracket. We cover everything from March Madness history and records, to lessons from past winners of our bracket game, to 7 common bracket-picking mistakes to avoid, to how to pick your bracket based on each team’s mascot. When is the NCAA national championship game? A champion will be crowned in the NCAA national championship game April 8 in Minneapolis. Semifinals games will be played two days before on Saturday, April 6, when the winners of each regional face off for a chance to play in the championship game. Much like the titular character from the fairy tale, a Cinderella team is one that is much more successful than expected. Examples in March would be Villanova’s 1985 championship run, when the eighth-seeded Wildcats became the lowest seeded team to ever win the title, knocking off the heavy favorite Georgetown. What are potential upsets for March Madness 2019? We won't know the matchups and who is in the NCAA tournament until Selection Sunday. In the meantime, we identified Wofford, South Dakota State, Murray State, VCU and Hofstra as five teams that fit the mold of squads that can surprise. Keep an eye on them if they make the tournament.